Making Technology work for you - Micro Concepts are dedicated to developing long term business relationships with our customers in the manufacturing and production industries, to implement, maintain, and develop cost effective, quality design and engineering productivity solutions. Achieved through the knowledge and understanding of our customersâ€™ business processes and goals, by our valued team of professionals, committed to integrity, quality and excellence. 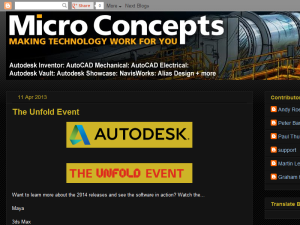 This what your Micro Concepts Technical Blog Blog Ad will look like to visitors! Of course you will want to use keywords and ad targeting to get the most out of your ad campaign! So purchase an ad space today before there all gone! If you are the owner of Micro Concepts Technical Blog, or someone who enjoys this blog why not upgrade it to a Featured Listing or Permanent Listing?